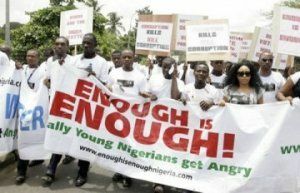 A civil rights organization, Anti-Corruption Network, has asked the Federal Government to release the money demanded by the Academic Staff Union of Universities or risk a protest from students and youths. The group, therefore, gave the authorities up to Monday to settle all outstanding issues with the ASUU leadership. Its Director, Outreach Services, Chief Timi Frank, stated this in an interview with our correspondent. The ACN was reacting to comments credited to the Minister of Finance and Coordinating Minister of the Economy, Dr. Ngozi Okonjo-Iweala, that the FG did not have the N92bn demanded by ASUU. He noted that the group would mobilize the protesters to “occupy” the state and federal ministries of education in the country. Academic activities in the nation’s public universities have been paralysed for six weeks, due to the industrial action embarked upon by the lecturers. Frank also accused the FG of deceiving Nigerians over the true state of affairs. Meanwhile, a Senior Advocate of Nigeria, Mallam Yusuf Ali, on Monday condemned the incessant strike embarked upon by university teachers. Ali, who spoke to one of our correspondents on the telephone, noted that the unending industrial actions were destroying the country’s university system. Although he admitted that the government should address the issues raised by the lecturers, Ali stressed that industrial actions would not solve the problem. He said, “It is quite unfortunate that the only way our lecturers think they can make government to meet their demands is by going on strikes. “While I think the government should do the needful, I think the lecturers should also stop embarking on strikes. “I don’t think strike is the solution.